Hosted by Prof. Martin van Creveld, the world's leading Israeli military historian. The IDF, the Israel Defence Force, is one of the most powerful armies in the world. Yet it is rooted in a small country with under eight milllion inhabitants; hence it cannot help but make its impact felt on every aspect of life, from politicis to economics to culture. When did this mighty military machine originate, and how did it become what it is? How did it grow, what were its most important characteristics, how did it compare with other armed forces around the world, and how did it succeed in becoming as strong as it is? How does the fact that Israel has lived on its sword for as long as it has affect economic, social, cultural, and religious life? Where is Israel's military power now, what are the most important challenges by which it is faced, and what are its prospects for the future? 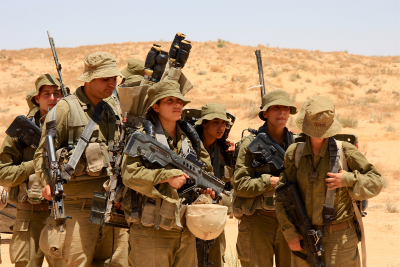 For good or ill, the Israeli Army is among the best-known in the world�hardly a day passes when it is not in the news. In the turbulent and dangerous part of the world known as the Middle East, it is the strong sword on which the country�s existence rests. In many ways the IDF is a typical modern army. However, it also has many charactericstics which may not be found anywhere else. Among other things, it is the only army in history that conscripts women and puts them into uniform even if they do not want to join out of their own free will. That was a real innovation. Over Sixty years after the establishment of the state, Israel still does not have peace with many of its neighbors. It faces many threats, starting with terrorism and ending with the nuclear weapons that Iran is building. Many countries in the Middle East have never reconciled themseves with Israel�s existence, seeing it as a foreign implant and fervently hoping that it will one day be destroyed. The TV-series Life by the Sword deals with the defense of Israel from the state's establishment in 1948 to the present day; at the same time, it will take a look into the future. 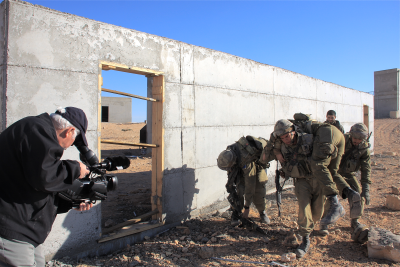 The series will provide an inside look into Israel's defense forces such as has never been shown before. It will include interviews with some of the best known Israeli public figures, and ordinary Israelis who will discuss the impact of defense on their own lives and that of their families. The series will contain a wealth of historic and archival film footage of hitherto unknown sources like from the Israeli army�s archive. The series is hosted by the prominent military historian and world wide known professor Martin van Creveld (b. 1946). Prof. Van Creveld is considered the world�s leading Israeli military historian and theorist. He is the author of numerous books on military history and Israel's armed forces, published in twenty languages. Professor Van Creveld was born in Rotterdam, The Netherlands, and lives and works for over 60 years in Israel. The rise of one of the twentieth century's mightiest military machines from very humble origins to the present day. This part deals with the 8 major wars Israel fought from 1948 untill today. It includes interviews with the wife of the famous general Moshe Dayan and with the daughter of the murdered Yitzhak Rabin, Chief of Staff during the six-day war. The film also tells the gripping stories of soldiers who fought in all these wars. How does the fact that Israel has lived on its sword for so long affect the life of its people? What is Life in a beleaguered society like? The impact of the army-machine on society�in other words, how Israeli life has been shaped by the requirements of defense. A look at the future of Israeli defense; what are the principal dangers in an environment hostile to Israel, what must be done, and will the country survive far into the twenty-first century in a rapidly changing Middle-East ? What will the future of Israel's defense be like and can the country continue living on its sword forever? This part will also deal with Israels high-tech warfare and its nuclear capacity. The latest developments like the Iron Dome, Arrow and drones will be shown. Can Israel maintain its fighting spirit and continue to live on its sword forever? Willy Lindwer produced and directed in his long carreer as a documentary filmmaker international award winning documentaries. His Emmy Award winning film �The Last Seven Months of Anne Frank� (1988) was worldwide shown. He won in 1993 the Dutch State Award for Film for �Child in Two Worlds� about Jewish war orphans. Willy Lindwer produced acclaimed biographies of Simon Wiesenthal, Yitzhak Rabin and Shimon Peres. His 2-part documentary �The Temple Mount is Mine� (2003) shows the dramatic story of rulers, religions and battles over Jerusalem�s most sacred site. Willy Lindwer�s films are world wide distributed. Willy Lindwer lives and works since 2001 in Israel. Willy Lindwer was knighted in 2010 by Her Majesty the Queen of the Netherlands with the order �Officer in the Order of Orange-Nassau� in recognition of his international work as a filmmaker.